Of course, I was rooting for Netta, I’m Not Your Toy, and Israel at Eurovision 2018. She had all my 12 points. But I was shocked when – at a packed Irish bar in Manhattan – the crowd cheered for Netta Barzilai’s performance more than they did for Ireland’s. And this was after 21 performance by other Finalists at Lisbon;s Altice Arena. I knew then that Israel had a good chance to win the popular vote. Netta brought empowerment and a message to the stage. And she was a fabulous ambassador and messenger, moving from someone who was rejected by brides from appearing at their weddings for not being pretty enough, to someone who is now a national and world hero. 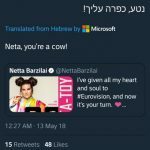 A small social media tempest erupted when Microsoft’s BING and other sites incorrectly TRANSLATED PM Netanyahu’s tweet to NETTA. It translated KaPaRa as the PM calling her a COW. Equally bad was when one site translated the word as ATONEMENT, instead of Hebrew slang term of affection. 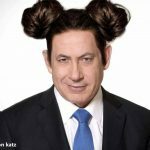 Alon Katz’s take on the NETTA FEVER sweeping the nation is below. Even the defense minister referred to the song’s win in his twet to Syria and Iran. The word COWabunga is very appropriate, she does look like a fat cow, why couldnt israel send a thin singer? How am i sexist and shallow? the truth is netta looks like an ugly fat cow, we have so many beautiful women to represent us, there was no reason to choose her.